Back with some free passes to checkout Parkland which is A recounting of the chaotic events that occurred at Dallas' Parkland Hospital on the day U.S. President John F. Kennedy was assassinated." Yep, that's all I've got ... plus the trailer below. Sorry, wish I had more to say about it. But between Fantastic Fest coverage and work I haven't had much time to research this one. And IMDb pretty much just has the simple too the point synopsis. It's not quite as uniquely intriguing as "A murdered man is reincarnated as a housefly and seeks to avenge his death." - but sometimes things are classics for a reason. 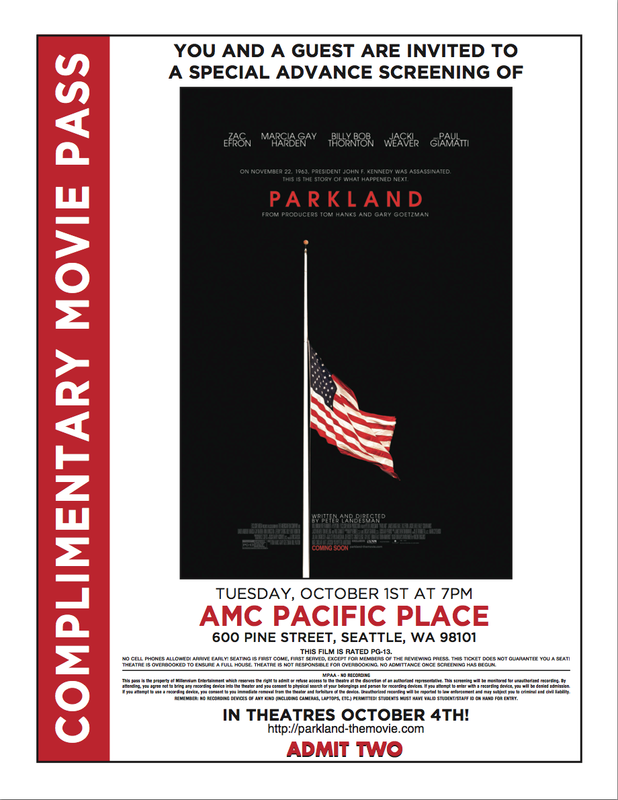 The screening takes place Tuesday, October 1st at 7pm at the Pacific Place AMC. All you need to do is download and print this PDF pass. Clearly given this super elite and restricted access distribution method there may be more than a few folks at the theater. As always admission is not guaranteed - and I'd suggest checking out the situation a bit earlier than normal. But if you're down with that there's a free movie in it for you. Look forward to hearing what folks who check it out think.